ATHENS, Greece, July 18, 2011 (ENS) – The European Investment Bank is providing 310 million euros (US$436 million) to the Greek Public Power Corporation to develop energy security and efficiency in Greece. The investment will add state-of-the-art, environment-friendly energy production and reinforced, extended and efficient electricity transmission and distribution networks throughout the country. At least half of the EIB funding is destined for the new Megalopolis natural gas-fired, combined cycle power plant in the central Peloponnese. The combined-cycle package will replace four coal-fired units at the site to help the country meet both its energy and environmental goals. Last year, Terna S.A., an engineering, procurement and construction firm in Greece, awarded General Electric a 92.4 euro ($130 million) contract to provide equipment and services for the project. The existing units at the site, which burn lignite coal, are scheduled to be shut down due to their environmental impact. 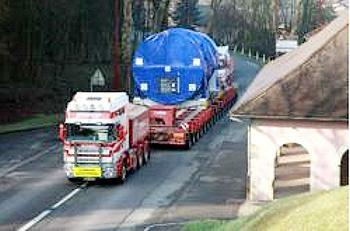 Commercial operation at the new Megalopolis power plant is expected in the fourth quarter of 2012. The plant will have a net output of more than 800 megawatts and will be one of the region’s most efficient power generation stations. The remaining 160 million euros will go to the extension and reinforcement of the Greek transmission and distribution networks, from high voltage of 400kV, down to low voltage. 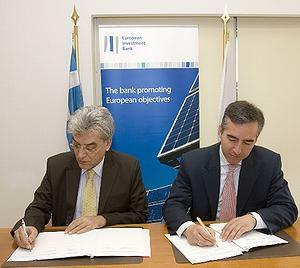 The finance documentation was signed last week at the EIB’s office in Athens by bank Vice-President Plutarchos Sakellaris and PPC Chairman and Chief Executive Arthouros Zervos. Ecofin is an independent investment management firm specializing in the global utility, infrastructure, alternative energy and environmental sectors with assets worth US$1.9 billion currently under management. Founded in 1992, the firm is based in London. “Through our 48 years of sustained good cooperation with PPC we have been able to provide significant support for power generation and electricity network investments in Greece,” said Sakellaris. In recent years, EIB financing in Greece’s energy sector has been directed towards securing sustainable energy supplies, reducing the burden on the environment and promoting the development of new sustainable energy sources. The EIB has supported the Public Power Corporation’s new Aliveri natural gas-fired, combined cycle power plant on the island of Evia, and network modernization to reinforce and extend electricity transmission and distribution networks throughout the country. The bank has also suppported the Greek Natural Gas Company’s priority Trans-European Network schemes, particularly investments in the liquefied natural gas terminal at Revithoussa, which has increased capacity and enhanced overall security of supply. The bank has helped to fund the construction of the high pressure gas pipeline connecting Komotini with Alexandroupolis and the Turkish natural gas network on the Greek-Turkish border. The European Investment Bank has also funded the construction of wind farms in Greece, furthering both European Union and Greek national policy on renewable energy and climate change.